Ferrets have unique feeding requirements, which are now finally being addressed by commercial pet food manufacturers, though with varying success. 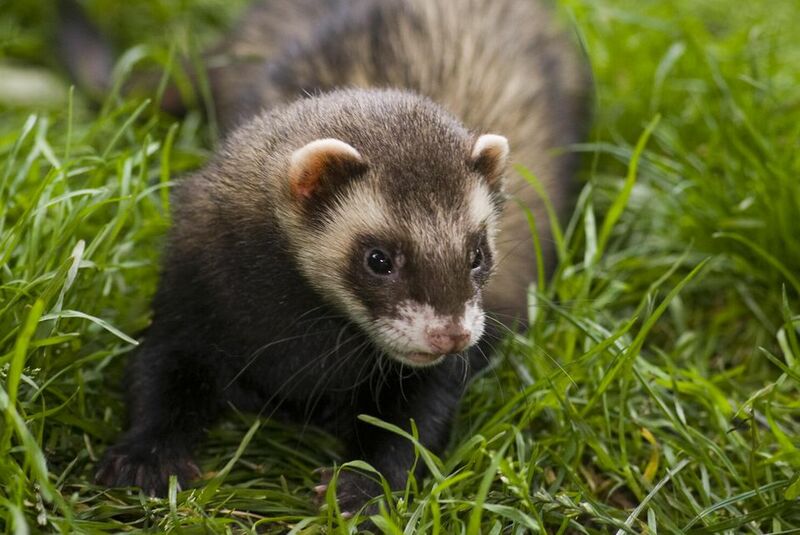 Ferrets are obligate carnivores and food passes through the digestive system of a ferret very quickly. They also lack the ability to derive nutrition from plant matter. For this reason, a ferret diet must be high in animal protein, high in fat, and low in fiber. All foods, including foods intended solely for ferrets, are not created equally, so be careful what you are feeding your ferret. Ferrets have a quick metabolism along with a short digestive system, so need to eat frequently (usually every 3-4 hours). It is best to have food available constantly. Most ferrets will eat only enough to meet their needs, and will not become obese if allowed constant access to good quality food. Fresh, clean water is also a necessity at all times. If you are having a problem with your ferret gaining too much weight, check with a vet to rule out a medical problem and for advice on meeting their diet needs while maintaining a good weight. Increased exercise is usually the best way to approach obesity once health problems are ruled out, rather than diet restrictions. Unfortunately, the nutritional analysis doesn't tell the whole story. You must also analyze the ingredient list as the quality and availability of the proteins and fats can vary widely. However, even ingredient lists can be misleading. The foods listed first are the highest proportion of the diet, but you have no idea exactly what proportion. Be aware of ingredient splitting, which can push similar but less desirable items down the list, but if added together, might make up a high proportion of the diet (e.g. soy flour and soy meal). Look for meat and meat meals as opposed to "by-products." Meat and poultry by-products are the bits that don't make it into human foods, and may be low in digestibility and therefore not really a useful protein source. Eggs are also a high-quality protein source. Look for meat or meat meals or eggs to make up the first three ingredients (you'll find very few foods that make this requirement - but definitely avoid any that do not have high-quality proteins or fats as at least most of the first 6 ingredients). Beware the use of corn gluten, soy meal, rice gluten, and other vegetable or grain-based proteins that may boost the protein content, but are not useful to ferrets. Also watch for added sugars (sucrose, fructose, corn syrup, etc). Just a note: ferrets may not like the taste of foods high in fish (and they may make the litter box pretty smelly, too), though some cold water fish such as salmon is an excellent source of fat. Look for high-quality sources balanced in omega 6 and omega 3 fatty acids (poultry fat is usually considered a good source). This can be hard to determine from an ingredient list or nutritional analysis, however, and the fatty acid quality and balance are affected by processing as well. There are several ferret diets available now, and some are better than others. Good diets tend to be expensive, but are worth it. To see the importance of comparing labels, MD Ferret PAWS, Inc. provides a nice comparison chart to allow you to compare a huge range of foods. The chart is long but ranks foods for you. You can see from the chart that there is no perfect diet - very few foods come close to meeting the requirements set out above. It is really a matter of picking foods that you can readily get that are as close to ideal as possible. The lack of truly ideal ferret foods is one reason there is a growing interest in more natural diets for ferrets. For many years, the common recommendation was to feed a premium dry cat or kitten food, but that recommendation is now considered out-of-date. As the science of ferret nutrition improves, there is little doubt that premium ferret diets are the best to feed ferrets. Still, if you are unable to find a good quality ferret food (consider ordering online if nothing else) you may have to settle for cat food. If so, make sure it is a premium diet (e.g. Eukanuba, Innova). Use a kitten food, high in protein, but as your ferret gets a bit older (4 years or so), switch to an adult food. Again, you must check labels, and pick foods with only high-quality animal proteins at the top of the ingredient list, and make sure they are high in fat and very low in grains, sugar, and fiber. Avoid generic or "grocery store" brands at all costs, as these are typically very poor for ferrets. Treats should be given in moderation. There are vitamin supplements for ferrets and hairball remedies which ferrets generally love, and they provide some benefits. These make good training aids and treats, but should be used sparingly. Other treats include eggs (hard boiled, scrambled), bits of cooked meats, or freeze-dried liver treats. Commercial ferret treats should only be used if they are meat based - avoid those with grains, vegetables or sugars at all costs. Ferrets have a sweet tooth but do not give in -- avoid sweet treats (including raisins and other fruits).